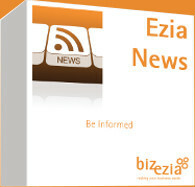 EziaNews is a daily round-up of business news which is produced by Bizezia and available for you to have on your website. You, your clients, customers and prospects, will be up-to-date with the latest news by visiting your website on a daily basis. EziaNews is an invaluable resource to be able to offer your clients and prospects totally free of charge. A portal will automatically appear as a window on the page you choose. Through this portal, visitors to your website will be able to see the latest daily business news as well as select by category and month. We’re very sure that you’ll gain real value from EziaNews. That’s why we have the confidence to guarantee it. We’re so confident that you and your clients and customers will be better informed by EziaNews that we’re offering a 30 Day Money-Back Guarantee. If, within 30 days from the start of your subscription, you tell us that EziaNews is not for you, we’ll refund your full subscription, with no questions asked. Read our product Licence Agreement. Visit our website at www.bizezia.com/news index to see it in action. There is no set-up fee for EziaNews, just an easy and affordable monthly or annual payment option with a minimum 12 month subscription. Get EziaNews for just £60 a month or £600 a year.